A new co-working space just for lawyers is due to open in a Tysons Corner office building in August. "Chisel" will feature 23 private offices, five conference rooms and other lawyer-centric amenities. WASHINGTON — The D.C. area has become a hotbed for co-working spaces, with more than 70 of them popping up in the last two years, and one of the newest is aiming for a niche of co-working members: Lawyers. Chisel is being created and sponsored by Tysons Corner-based law firm FH+H in space at its 1753 Pinnacle Drive location. 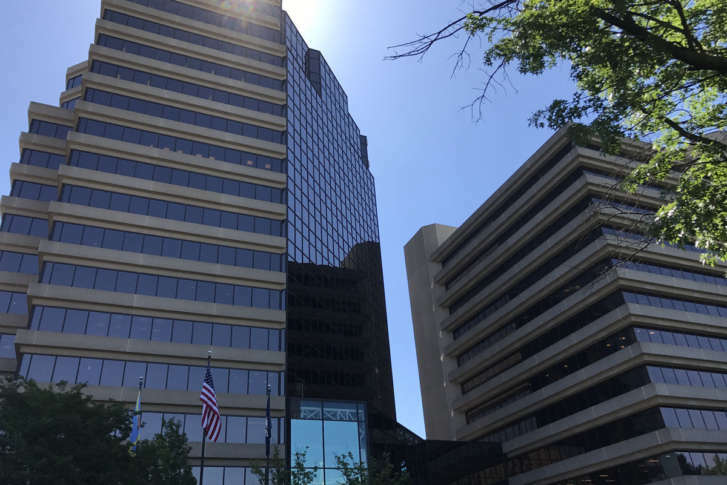 The firm has signed a long-term lease for 10,500-square feet on the 10th floor of its building and hopes to open it Aug. 1. Washington is a good test-ground for co-work space designed exclusively for attorneys. “If a tree branch falls on someone randomly in the area, it has like a one in 12 chance of hitting a lawyer. There are just a lot of lawyers in D.C.,” FH+H partner and Chisel creator France Hoang told WTOP. The D.C. region has the highest concentration of lawyers per capita in the nation. We tend to think of the DC region’s throngs of lawyers working at major law firms and lobbying shops, but the opposite is actually true. “Seventy-five percent of lawyers are actually in private practice, and of those, half are solos,” Hoang said. “Big firm lawyers get all the attention, but the reality is, particularly in D.C., there are a lot of lawyers who are solos, full-time or part-time,” he said. Chisel, whose build out is reaching completion, will have 23 private offices, 32 “flexdesks,” a quiet room, five conference rooms, four telephone rooms and an event space that can hold more than 50 people. FH+H also has the option to lease additional space if there is demand. One of the reasons traditional co-working space doesn’t work for many lawyers is the lack of privacy, especially considering the profession’s need for client confidentiality. Other lawyer-centric amenities include huddle rooms appropriate for depositions, lockable storage and secure printing. Sign-ups for Chisel begin June 30, with 24/7 access memberships ranging from $300 to $1,400 a month.